Using thin stone is more versatile than you think. With such a savvy modern consumer base, materials have evolved to meet the various demands of homeowners. As demographics change and people downsize their homes, the rise in popularity of smaller and thinner stone countertops has made a dent in the fabrication industry. In fact, thinner countertops may actually create the look of larger kitchens in small spaces. However, the perks of thin countertops go far beyond just the beautiful aesthetic. Here are a few reasons why using thin stone is actually practical and functional. Most often you see stone used as a countertop material. However, did you know that stone can be used in place of backsplash in your kitchen? In fact, instead of the typical tile backsplash featured in a majority of kitchens, using a thin slab of stone is a wonderful way to add some unique personality to your kitchen design. Used for both interior and exterior rooms, using stone as a feature wall can be quite beneficial. For instance, with stone, there is no worry about any nasty grout that typically accompanies a tile backsplash. Therefore, using thin stone instead of a tile backsplash is a great way to combine beauty and practicality into your kitchen design. If you desire floating counters you will need to use thin stone to create a clean and sleek aesthetic. 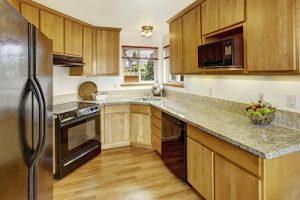 In fact, floating your countertop from a wall without a cabinet underneath is a very modern design feature that is rising in popularity amongst homeowners. Therefore, if you want to jump on the latest trend in kitchen design, you will need to use thin stone slabs as your material. Many designers are even eliminating backsplashes altogether. Instead, many kitchens are now featuring a full slab of stone as their entire backsplash. In fact, extending your backsplash to your ceiling line and wrapping around cabinets and range hoods creates an extremely elegant and sleek look within your kitchen. This contemporary design feature is a great way to use thin stone within your kitchen design. This entry was posted on Thursday, March 2nd, 2017 at 3:31 pm. Both comments and pings are currently closed.